In a crowded year for horror, The Prodigy just might rise to the head of the class. A trailer for the fright flick was posted this morning to Orion Pictures' YouTube channel, just a day after the studio released a spooky new poster featuring its ominous tagline: "What's wrong with Miles?" The new spot offers scant clues as to the answer, but it's probably not a touch of the flu. The Prodigy is the latest entry in the venerable "creepy kid" subgenre, which has produced such classics as The Omen and The Bad Seed. The trailer opens with a pair of loving parents, John and Sarah (Peter Mooney of Burden of Truth and Orange is the New Black's Taylor Schilling) welcoming their baby son, who shocks them by uttering his first word before he can even crawl. We then see the youngster as a precocious tot, undergoing an intelligence test. The results similarly blow the mind of an attending doctor: "Miles isn't like other kids," she says. "His intelligence is off the charts. I don't have an exact score, but it'll be very high." Cut to the child examining a bug in the palm of his hand, which he unceremoniously crushes as the doctor's voiceover intones, "He's special." We then get a series of quick cuts which hint at some exceedingly disturbing behavior on the part of Miles (portrayed by Jackson Robert Scott, recently seen in 2017's It: Chapter One as the doomed Georgie Denbrough). "Miles is having a very difficult time making friends," Sarah says in voiceover, as we see the boy in what appears to be a science class, purposefully striding along lugging a wrench half as big as he is. We then cut to Sarah counseling her son in his bedroom, asking him to tell her everything he remembers (possibly in reference to the wrench incident), to which he replies that he doesn't remember anything. Then, the arrival of a "specialist": Arthur Jacobson (Colm Feore, House of Cards), who warns Sarah flat-out that her child is dangerous. Reinforcing this opinion is the kid's own Dad, who is seen looking a bit harried in his garage, saying, "I don't feel safe with him in the house." The cuts get even quicker, suggesting all kinds of weirdness: Sarah's discovery of some odd clippings and drawings, some kind of car accident, and the theft of a pair of garden shears. "He's so different now," Sarah says in one shot, which is quickly followed by another of Miles approaching his mother from behind wielding a hammer. She continues in voiceover, "I feel like I don't know him." We then cut to black, fading in on a truly creepy shot: Sarah in bed, a look of abject terror on her face, as Miles' tiny hand snakes its way over her shoulder. "Mommy," he says, "will you always love me… no matter what I do?" Cue title card, end of trailer. The spot suggests that The Prodigy will make good on the scares promised by its excellent behind-the-camera pedigree. The flick is directed by Nicholas McCarthy, whose debut feature The Pact was well-received, and who contributed the bizarre and freaky "Easter" segment to the 2016 horror anthology film Holidays. The script was penned by Jeff Buhler (The Midnight Meat Train), who has been very, very busy. 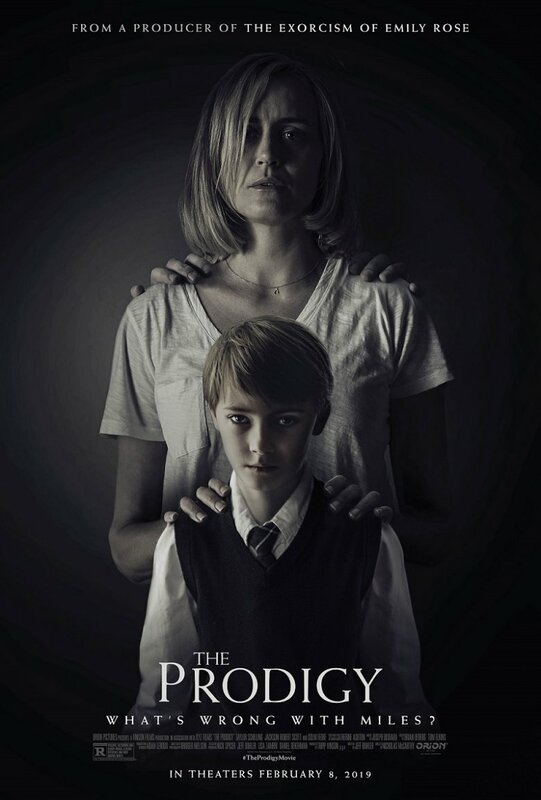 The Prodigy is the first of no fewer than four horror features on tap from the scribe this year; following it will be reboots Jacob's Ladder, Pet Sematary, and Grudge. McCarthy got horror fans pumped for the picture with an Entertainment Weekly interview late last year, suggesting that it has some surprises up its sleeve for audiences. "Four years ago, I was sent a script for this movie," he said. "For the first half, I was thinking, 'Wow, this is a really interesting, and creepy, and twisted variation on the evil kid subgenre.' But then the script just went to this place that I couldn't believe. That's what made me go from, 'Here's a movie I think might be cool' to, 'Here's a movie that's gotta be made.'" The director also shared that, during test screenings, one scene in particular proved a little bit too effective. "The first time we previewed the movie, there is a section where people screamed so loud that we had to go back and re-edit the scene that followed it, because people were still recovering from what they had just seen, and they were missing the dialogue," he said with a chuckle. Horror aficionados, rejoice: 2019 is shaping up to yield an embarrassment of riches, with The Prodigy setting the bar early. The flick will premiere on February 8; in the meantime, check out the unsettling poster below, and let the speculation begin as to exactly whose hands those are on Sarah's shoulders.